Mortice locks are generally stronger and secure than a bored cylindrical lock. 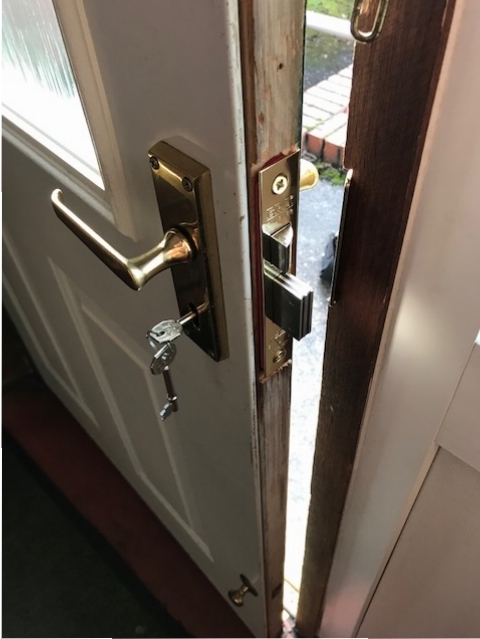 Ironically, installing a Mortice Lock initially can weaken the structure of a typical wooden door, but by choosing a 5 lever Mortice Lock your home will be more secure. Mortice locks are also very versatile and can accommodate a heavier return spring and a more solid internal mechanism. They can typically accept a wide range of different manufacturers cylinders and accessories as well, which gives them great versatility, especially on site. The security of Mortice Locks is important to homeowners and insurance companies alike. Most insurance companies will require at least one of the locks on one of your external doors to be certificated to BS 3621, or have 5 levers. The most secure Mortice Locks have 5 levers, so the security benefits are there for all to see. As a homeowner, you need to check your locks to see if they comply with these standards. If you are unsure where to check or look to see if your lock is of British standard, you can find the British Standard kitemark on the faceplate of the lock. If it isn’t there it could be imported from Europe or elsewhere and could render your home insurance policy redundant, in the unfortunate event of a break in. If you are unsure about whether your lock is compliant just give us a call on 0114 345 0145 and we’ll be happy to help. This Mortice Lock is generally used in entrance doors to houses and properties and has lots of thief resistant properties. For example, this lock has 2,000 different key combinations, so any thief wanted to guarantee to get into your home, would need 3 hours of time and 2,000 keys about their person. They also have hardened steel spindles in the brass deadbolt to prevent the cutting of the deadbolt. A hardened steel plate over the lock casing will also prevent drilling through the lock. To find out more about the security of Mortice Locks, call Stephen on 0114 345 0145 if you are in the Sheffield area.